Enjoy Special Offers This 2019 with Mark Warner Holidays Newsletter Sign-ups! Where do I use my Mark Warner Holidays voucher code? Click on a code or deal, copy the code (if applicable) and follow our link to markwarner.co.uk. Search for a sun or ski holiday and enter your personal preferences. Choose from the choice of rooms. Select any extras then continue to flight details. Enter all passenger details before continuing to the payment section. Any discounts (deals) will show in the ‘Discounts’ section. If you’re using a code you can now enter this in the 'Have a promotional code?' box underneath. Click ‘Add Code’ to apply your discount and proceed to confirm your booking. 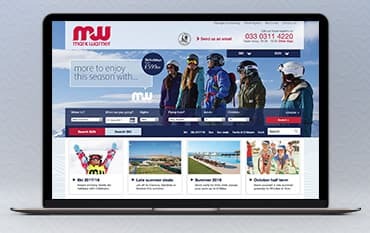 "Find great holiday and ski deals on the Marker Warner website." Book your summer and ski holidays with Mark Warner and enjoy a combination of great locations, relaxed surroundings, superb facilities and helpful staff. For ski breaks in winter you can enjoy picturesque chalets, excellent snow resorts in brilliant locations and apres-ski gatherings with like minded people and fellow winter thrill seekers. Or, if it’s summer or beach holidays you’re looking for, you can enjoy idyllic Mediterranean beach resorts with fantastic activities like watersports, tennis and cycling, with the freedom to unwind by the pool and enjoy the superb hotel amenities too. Whether you’re looking for family holidays, activities holidays, adult only holidays, group holidays, snowboarding holidays, watersport holidays or breaks in the school holidays, you can find them all for an affordable price at Mark Warner. Mark Warner Holidays is well known for its award winning childcare programme that looks after children aged four and upwards. This childcare service provides fun filled activities and facilities to keep your little ones entertained morning to night. And, there’s also expert british instructors on hand to help kids learn new watersports or snowports during your getaway abroad. If you’re the adventurous type, a skiing holiday might just be the perfect way to spend your next vacation. Whether you’re heading to the slopes as a couple, with your family or a group of friends, ski and snowboarding holidays at Mark Warner offer everything you need for the perfect snow break. If you’re looking for a skiing or snowboarding holiday in Europe, the family-friendly resorts in Italy, France or Austria are perfect for keeping the whole party happy. Not only do these resorts provide snowsure conditions, they also provide for every skiing status, so whether you’re a skiing expert or a complete beginner, there is something fun for everyone to enjoy. Couple the freedom of the slopes with delicious home cooked food, lively apres gatherings and stunning chalets and lodges and you have all the ingredients for a perfect winter break. If you’re after a beach holiday you can find many great destinations and resorts at Mark Warner, as well as low cost regional flights that beat the price provided by many other popular holiday retailers. Choose from sun holidays, family holidays, half term breaks or adult only holidays and enjoy a lovely sunny break in a stunning European country. Whether it be Greece, Paleros, Rhodes, Lemnos, Turkey, Sardinia or Corsica you can find a great beach holiday for an affordable price, and if you’re a club member you can enjoy incredible savings on your beach holiday too. Whatever destination, resort or type of beach holiday you choose from you can enjoy a great selection of activities and watersports including sailing, windsurfing, foiling, water skiing, wakeboarding, scuba diving, kayaking, paddle boarding, road cycling, mountain biking, tennis, fitness and even health and beauty retreats. Smoking and e-cigarettes are only allowed in designated smoking areas around the hotels and resorts supplied by Mark Warner. Although people with disabilities are welcome, some of the Mark Warner hotels are more suited than others. For more information please call the sales team who can ensure your resort is fully equipped to support you. How can I contact the sales team? Mark Warner is an independent British tour operator with over 40 years of experience in ski and sun holidays. Well catered for families, Mark Warner Holidays’ offer a selection of unique resorts with great facilities, spacious rooms, convenient locations and superb childcare provision for children of all ages, they even operate adult only weeks in many of these resorts too. Whether you want to relax in the sunshine in a Mark Warner resort in Greece, Corsica or Sardinia, or take to the slopes in France, Austria or Italy, Mark Warner Holidays has the perfect holiday for you, and if you use a discount code from us you can enjoy incredible savings on your getaway too. We are constantly on the hunt for Voucher Codes for Mark Warner Holidays to help you with your money saving. Our experts check dozens of sites for secret codes including NHS discounts, student sites & social media channels saving you time & money!